The inspiration for this essay comes from my almost nineteen years of research into the Great Cross of Hendaye and the French alchemist Fulcanelli. The unknown, anonymous, alchemist Fulcanelli in his masterpiece The Mysteries of the Cathedrals first brought the cross at Hendaye, France to the world’s attention. While the details of this research can be found in other articles written by myself (at jayweidner.com) and in the two books I co-authored (A Monument to the End of Time: Alchemy, Fulcanelli and the Great Cross and Mysteries of the great Cross of Hendaye: Alchemy at the End of Time) it can be stated that the Great Cross at Hendaye appears to be describing not only the end of the great four ages of the Hindu Yuga system but also the four ages of alchemical chronological time keeping. According to the cross at Hendaye the Iron Age, or the Kali Yuga, will be coming to an end with the galactic alignment on the winter solstice of December 21st 2012. According to the mythology of the Yuga system there are four ages of life and time on our planet. It is important to remember that there are many cycles within cycles in the Hindu Yuga system so the years mentioned next may have to do with a larger cycle than the one addressed in this article. Perhaps the huge number of years referred to below is the cycle of the solar system as it circles another star or perhaps it is a portion of the great cycle of one revolution around the galactic center. The first age is the Satya Yuga or the Golden Age according to Fulcanelli. The Hindu texts tell us that this age lasts 1,728,000 years. This is an age of extreme splendour when the beings on our planet appear to live much longer than they do now. In this age there are no wars, famines strife or evil. The second age is called the Treta Yuga, or the Silver age. As in the second law of thermodynamics, or entropy, things begin to slip in this age and the beings on Earth begin to deteriorate. This slippage, at least during this second age is the beginning of corruption and evil is introduced into the planetary sphere. This age lasts 1,296,000 years according to the Vedic texts of India. The third age of this cycle is called the Dvapara Age, or the Bronze Age. This is the beginning of the ‘fall’ of humanity. In this age corruption comes on more fully, evil begins to spread and things start to fall into disharmony. This age lasts 864,000 years. The last age is called the Kali Yuga, or the Iron Age. This age is the age we are in right now. Evil and corruption become the driving force as greed, wars, famine and disease spread across the planet like a tidal wave of death and destruction. This age lasts, according to the Hindu texts for 432,000 years. (For more information see also Tolkien at the End of Time: Alchemical Secrets of the Lord of the Rings by Jay Weidner and Sharron Rose at jayweidner.com, or see Reflections on the Cycle of the Great Yuga by Sharron Rose at sharronrose.com). What is important to understand while discussing these huge numbers found in the Hindu texts is that they are describing the four ages within a context of understanding that each successive age is shorter than the previous age. The Satya Yuga, or the Golden Age, is one quarter longer than the Treta Yuga, or the Silver Age. The Treta Yuga is one quarter longer than the Dvapara Yuga, or the Bronze Age. Understanding these differences in the lengths of the ages becomes important to the following discussion. According to Fulcanelli and the cross at Hendaye, the alchemical Four Ages comprise the four quadrants of a 25,920 yearlong cycle called the precession of the equinoxes. Essentially, the precession of the equinoxes can be explained by the fact that our Earth has a wobble. Like a top spinning on the floor, as it begins to lose momentum this wobble of the earth takes nearly 26,000 years to unfold. 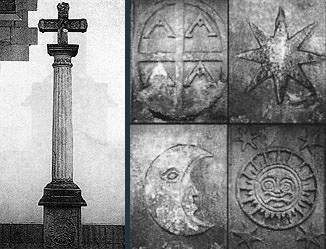 The strange engraving of the four ‘A’s’ on the cross of Hendaye is a “hieroglyph of the universe”, according to Fulcanelli. It is “comprised of the conventional signs of heaven and earth, the spiritual and the temporal, the macrocosm and the microcosm, in which major emblems of the redemption (cross) and the world (circle) are found in association”. What Fulcanelli appears to be saying here is that the precession of the equinoxes is to be divided into four distinct ages of 6480 years each (4 divided into 25,920) or, to round off the figures to approximately 6500 years each. This is also interesting because the zodiacal cycle, which lasts 25,920 years, has four fixed signs. These are the signs of Aquarius, Taurus, Leo and Scorpio. These four signs are separated by 6,500 years each. Also in the Book of Ezekiel and in the Book of Revelation we are told of the angel with four faces. This angel has the face of a Lion (Leo), a Bull (Taurus), a Man (the angel) and an Eagle (in older times Scorpio was represented by an eagle instead of a scorpion). Apparently, according to Fulcanelli, both of these books in the Bible are warnings and messages about the four quadrants of the precession of the equinoxes and appear to be telling us that there is some kind of great change whenever we arrive at one of these four signs. Of course it is well known that we are currently entering the Age of Aquarius. The Cross at Hendaye and Fulcanelli are telling us that there are tremendous changes to be found here on Earth when we enter into one of the four fixed signs. Apparently these changes can be cataclysmic. Obviously this 6,500 year long dating of the four alchemical ages disagrees with the Hindu Yuga system, which insists that each Yuga is of varying time lengths. It is in trying to iron out the dissimilarities in these two time periods that the hyperdimensional aspects of time can be best revealed. It is well known in modern physics that the four dimensional space, of which time is an aspect, is in the shape of a hypersphere. This hypersphere appears similar to the shape of a donut, or a bagel. The energy, or the flow of the energy stream, within this hypersphere works like this: As shown in the illustration, the flow comes out of the bottom of the sphere, winds its way up around the outside edge, crosses the outside equator of the torus sphere and moves towards the hole in the top of this torus. 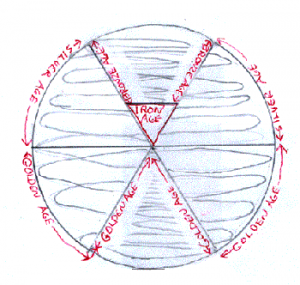 The energy flow then begins to fall through the top of the hole and begins to spin in a vortex. This energy flow continues until it comes out of the bottom side of the torus where the energy flow begins its outward expansion again. This flow is continuous and, in a sense, is infinite. Scientists love to be able to construct objects using straight lines, so they have created the hypercube to help them better understand the hyperdimensional universe that surrounds us. Alchemists however, like to use the curved lines of nature, so the donut shaped torus or hypersphere, is a better, more natural visual description of hyperdimensional space and will be the one I use in this essay. In order to begin to understand the topographical nature of time it is very important to understand the guts of this hyperdimensional sphere. By the ‘guts’ I am referring to the vortexes that make up the energy flow that runs through the center of the hypersphere. As the energy flow begins to fall into the vortex that runs through the center of the sphere it takes on the shape of a tetrahedron. A tetrahedron is the building block of three-dimensional space and is the founding member of the Platonic Solids. The tetrahedron is the simplest object that can be created in three dimensions. The only object with just four sides, the tetrahedron is also shaped like a vortex. Let us digress for a moment and discuss vortexes. Back in the Midwest, where I come from, there is a place called Tornado Alley. This is the flat Great Plains that stretches from Texas to the Dakotas. Each year this area is visited by numerous tornados, which wreak havoc on the farms and towns of this area. These tornados usually start in May and last until early August. Having witnessed several tornados in my early years I became fascinated by them and was once even a ‘storm chaser’. In my young and foolish days I used to chase after tornados with my Bolex 16mm camera in order to capture them on film. I became very familiar with these lethal vortexes. 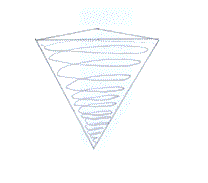 But understanding tornados also helps us understand vortexes and the density of forces in the hypersphere. Tornados (and also hurricanes) are made up of air like that which surrounds us all the time. But as the air begins spinning it takes on a strange solidity. While the swirling air at the top of a tornado is somewhat dangerous, it is the spinning air near the surface of the ground that is really dangerous. Near the tip of a tornado, where it is in contact with the ground, the air takes on the quality of solid iron. The tips of tornados can rip buildings apart, throw cars and trucks thousands of feet and punch chaffs of wheat into the very center of a trees like a bullet. As the air spins more violently, the tip of the tornado vortex becomes as strong as 50 locomotives engines and possesses the density of the hardest of metals. Yet it is just comprised of air molecules. But these molecules are spinning so quickly that they create a mass that is extremely powerful. It is the spin of the air that causes it to densify and take on the solidity of metals. 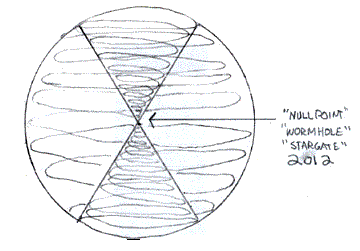 Getting back to the central core of our hyperdimensional torus we can understand the vortexes inside this sphere and how time unfolds by using the tornado analogy. As the energy flow begins to dip down into the top of the tetrahedral shaped vortex it begins to spin. As the energy flow descends, its spin becomes more rapid and compressed. Like a tornado, as it reaches further down, the tip of the vortex ‘hardens’. It could be said that his hardening of vorticular forces is what makes up the solidity of our three dimensional space. Each human, plant, animal and indeed every planet and star alike are the hardened tips of hyperdimensional vortexes, which are flowing all around us constantly. Like air, these hyperdimensional forces are pretty much invisible to us. It is only when these forces coagulate into a spinning vortex that they can be seen and felt. It is through the rapid spinning of four-dimensional space that the solidity of the third dimension is actually created. The mystics from all great traditions know this and they realize these inner dynamics of the fourth dimension as it interacts with the third dimension. The fourth dimension is the surrounding sphere and the third dimension are the tetrahedral vortexes that make up the central core of the sphere. To the ancients, four-dimensional space was called ‘spirit’ and three-dimensional space was called ‘matter’. So what does this have to do with time and the topography of time? Remember the dilemma that we face in trying to make the four ages of the precession match up with the Ages or Yugas from the Hindu system? By attempting to make the two into one we can not only understand the topology of time, but also we can map time like the ancients and we can know where we are in the river of time. Imagine that we are coming through the very center of where the two tetrahedral tornado vortexes intersect at the very center of the inner hyperdimensional sphere. Moving down the bottom vortex towards the outside surface of the sphere, each spin in the vortex takes longer and is wider and slower than the previous spin in the vortex. In other words, the energy flow expands after it passes the ‘null’ point in the very center of the hyperdimensional sphere, or torus, where the tips of the two tetrahedral vortexes touch. This energy flow continues its expansion as it climbs over the lip of the bottom edge of the sphere where the vortex meets the outside edge of the sphere. The energy flow continues to expand until it reaches the outside equator area of the sphere. Once it gets past the equator, the energy flow begins to condense, the flow begins to move faster and the spin density increases. This flow continues until the energy flow reaches the upper lip of the outside of the hyperdimensional sphere where it begins to ‘fall’ into the top of the tornado tetrahedral vortex. Now as the flow of energy falls down the vortex towards the null point at the very center of the sphere it begins to harden as it spins faster and faster. This goes on and on until the vortex is so hard it is like iron. This is how the fourth dimensional forces create three-dimensional reality. As the vortex spins faster and faster eventually it compresses down to the point where it has nowhere to go but outwards again. This occurs at the null point in the center of the sphere and the energy flow now begins to once again expand. The Golden Age is the time period that starts at the null point in the center of the sphere and continues through the bottom vortex. As the energy flow expands outwards time appears to slow down. The entire period of the Satya Yuga, or the Golden Age, continues as the energy flow goes down the bottom vortex and rounds across the top of the sphere. It continues expanding until it arrives at the equator. The equator of the outside of the hyperdimensional sphere is the borderline between the Satya Yuga and Treta Yuga, or the Golden Age and the Silver Age. Now the energy flow begins to contract as it flows upwards towards the north pole of the hypersphere. The Silver Age, or the Treta Yuga, continues until the energy flow rounds the top lip of the hyperdimensional sphere and begins to fall into the upper tetrahedral vortex. This then is the borderline between the Treta Yuga and the Dvapara Yuga, or the border between the Silver Age and the Bronze Age. About two thirds down in the upper vortex, where the energy flow is spinning so fast that it becomes as solid as iron, is beginning of the last Age, the Kali Yuga, or the Iron Age. This spinning continues to gain density and compression and speed as it races towards the central null point in the very center of the sphere. As it approaches this null point the forces become unbelievably fast, violent and dense. It is only when these forces achieve maximum density and they can no longer compress any further that they begin to suddenly flip and begin the expansion of the flow. This happens in an instant. This is the shift from the Iron Age, or the Kali Yuga to the Golden Age, or the Satya Yuga. The borderline between the Iron Age and the Golden Age is the most distinct border in this topographical illustration of hyperdimensional time. It is the most jarring and is instantaneous. 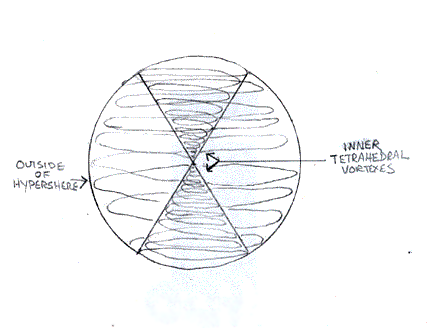 Take notice of the hourglass shape of the two tetrahedral vortexes inside the hyperdimensional sphere. Is this why Fulcanelli tells us about the hour-glass in the quote at the beginning of this article? In the Hindu mythology the God Shiva dances the world into and out of existence playing his dhamaru which is a two sided drum shaped like an hourglass. Notice that, like the number of years in the Hindu Yuga system, the distance traveled through our ages in the hypersphere is similar; the Golden Age, which is the distance between the null point in the center and the outside equator is twice the distance as that traveled through the Silver Age which is the distance from the equator to the top of the lip of the upper vortex. Equally, the distance traveled from the top of the vortex to two thirds down, which is the Bronze Age, is half the length of the Silver Age. Finally, the tip of the vortex is half the length of the Bronze Age. This part, called the Iron Age, is the Age in which we live. This is also why, in the Iron Age, each second feels shorter than the second before. This is why each day, each month and year appear to be going faster than they did previously. In the topology of time this effect can be easily understood and explained. Also remember even though the distance traveled is much further in the Golden Age than it is in the Iron Age, the number of years it takes is the same. It takes 6,480 years to go through the Golden Age just as it takes 6,480 years to go through the Iron Age, but it feels much different. In the Golden Age each second, each day, each month and year appear to be longer than the previous day, month and year. Time is expanding in the Golden Age and with that expansion the anxiety and tension of the Iron Age disappears. It is a paradise, especially to those who may have survived the passing through the wormhole, or the null point at the center of the hyperdimensional sphere. Therefore, the years listed within the Yuga system are actually symbolic times that explain the lengths of time as it is felt not as it is lived. So the Golden Age or the Satya Yuga feels like it is much longer than the Kali Yuga, or the Iron Age. The shamans in Peru tell us that we are approaching the Pacha Cuti, which means, literally ‘the world turned upside down’. They say that it will arrive in the year 2012. This is also the year when the great Mayan calendar reaches its end point. The cross of Hendaye is quite explicit in saying that we are reaching the very end of the Iron Age. I would suggest that the null point, or the wormhole at the very center of the hypersphere, is very likely the 2012 date. Our hypersphere appears to be regulated by the periodic alignment of the galactic center with the sun. This also matches the four fixed signs of the zodiac and explains why the Christian tradition is preparing for the endtimes. The unknown builder of the mysterious Cross at Hendaye gives the entire hyperdimensional map to us on a platter. Fulcanelli coyly ignores it knowing that its meaning will only become clear when one has truly understood alchemy. At the very top of the Cross, on the west side, just above the broken Latin Inscription, sits a single ‘X’. 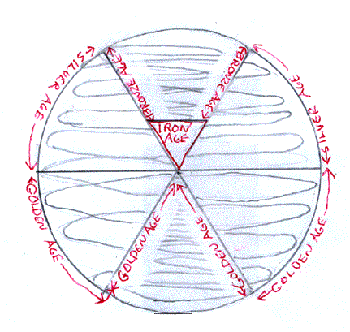 This ‘X’ is the inner map of the guts of the hyperdimensional sphere and reveals the hourglass shape in a clear and concise manner. 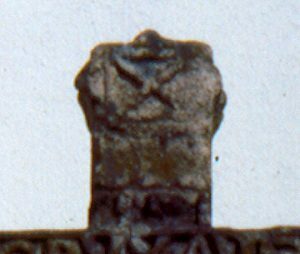 The ‘X’ is truly the most mysterious symbol on the Cross at Hendaye and its meaning is finally revealed here in this article. It is through our understanding of the Four Ages, the fixed signs of the zodiac and the Yuga system that we can finally appreciate the message that our ancestors have handed down to us. We are about to pass through the Star Gate, the wormhole, and the null point of hyperdimensional space. The Cross of Hendaye reveals the most important knowledge of all, which is the end of time and the beginning of the Golden Age. Awareness of this knowledge helps us all to more fully comprehend the nature of the times in which we reside and the destiny of the human race. Incidentally the human life span has a strange association with the hypersphere and the topology of time. 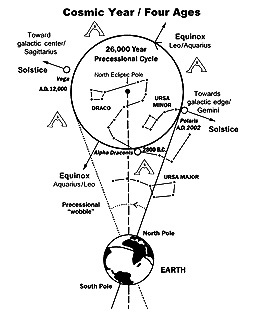 It takes 72 years for the precession of the equinoxes to advance one degree (360 X 72 = 25,920). Interestingly, at least during the Iron Age, the average human life span is about 72 years, which is 26,280 days, very close to the precessional figure of 25,920. Incidentally, the ancients thought that the year had 360 days, which would have made 72 years come out to exactly 25,920 days. But the human life span can also divided into four Ages. If we divide 72 years into four periods of 18 years each we can discover our own personal four ages of existence. There are 6510 days in each of these 18-year periods. The Golden Age of a human is from their birth to when they reach 18 years of age. The Silver Age is the next period from 18 to 36 years old. The Bronze Age of a life is from 36 years old to 54 years of age and the Iron Age is from 54 years old to 72. Like the four great ages of alchemical timekeeping these four ages also feel different. It seems to take forever to get to be eighteen years old. But when we are 54 years old, or older, the days and years feel as if they are flying by. Also the body appears to gain density as we age. Our bones creak and arthritis begins to attack us as we age. It becomes more difficult to lose weight and we become set in our ways. Even our lives appear to be ruled by the topology of hyperdimensional space.